When we started designing Sellf, we had in mind more than a CRM. We had a clear idea of the direction in which CRMs should be going: according to our vision, CRMs should not be passive business tools. They should engage whoever is using them, generating collaboration and positive competition in a team, while solving problems actively.But let’s start from the beginning. The main problem with CRMs is that people don’t actually use them, because they think it’s only a monitoring tool imposed by the company and they don’t feel the benefit from the time spent using it. To overcome this problem, we decided to design Sellf by putting sales goals first, both at a personal and at a team level, motivating small businesses and professionals to be more productive and to run the extra mile to achieve their objectives. We worked hard to make Sellf really part of your workflow integrating it with the online tools you commonly use to bring forward your selling activities. But really, the direction we think the CRM world should be going is to make it part of your team. Not a tool, but an intelligent asset that supports you in your business activities and helps you find things, solve problems and fulfill tasks faster. The CRM should be the beating heart of the team, where all the sales conversations take place and people can share their successes, failures and can ask for help. Now, we think that the time has come: 2016 has been declared by many tech influencers “the year of the BOTs”. BOTs are intelligent algorithms that answer your questions through text messages, without you even noticing they had accessed different applications to provide the information or fulfil the request. Like a form of artificial intelligence, they make possible to smoothly integrate different apps, making all the information accessible from one center place. Apps are going to become “invisible”: they will follow you everywhere, probably under the form of BOTs, and you will be able to interact with them like with other people in your team, e.g. via chat messages (if you want to know more about this topic, we suggest you reading this article from The Verge: http://www.theverge.com/2016/1/6/10718282/internet-bots-messaging-slack-facebook-m). Sellf’s vision of CRM apps is one of a tool that can really follow you everywhere and help you reach your sales goals in any possible ways. The integration with Slack is a very important step towards that vision. Slack is one of the best tools for teamwork right now, it makes it super easy to chat with the people in your organization, share files and information and it reduces to almost zero internal emails. We believe that Slack is even more than that: it is the business messaging service that firstly understood the immense power of integrations. Slack was built as an open platform for work since the beginning, encouraging other applications to add their integrations in the form of BOTs. Thanks to this you can use an ever increasing number of business apps without ever leaving Slack. You can for instance add a card on Trello, delete a to-do on Wunderlist or access a Google Drive file all by just typing a simple message in Slack. We tested it first hand within the Sellf team, integrating all the different online tools we use in Slack; the result? Slack is the hub from where we have a complete overview of everything we do within our company and of every feedback we get from our community. Everybody in our team is using Slack and our involvement and passion for Sellf and for the Sellf community has only increased by adopting it. We believe that Slack will become one of the main platform for business apps, similar to what iOS and Android have become for mobile apps. Developers, like us, can already provide access to their applications, as BOTs, and apps for business for the first time will become the best business assistants you can hire for your organisation, you will be able to chat with them and ask them for information or to perform tasks to boost your productivity. But here is another news: our Slack integration is going to evolve soon! 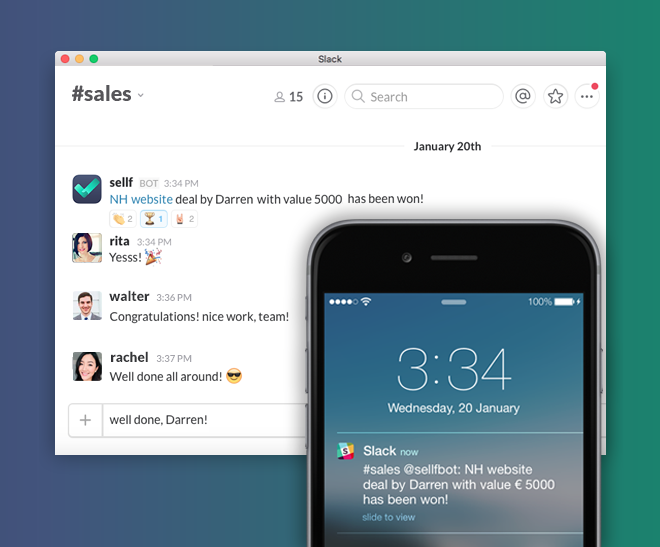 You will in fact be able to interact with Sellf directly from within Slack. Creating new deals, planning to-dos, recalling notes and more. But before doing this we want to know what you think! So send us an email at hello@sellfapp.com to let us know what you think about our Slack integration and to tell us what you’d like to see Sellf help you do within Slack! Unfortunately booking a taxi ride is not going to be on our feature list though 😀 (but you can already do it with this integration).